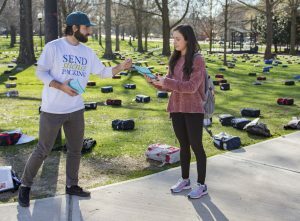 Active Minds’s Send Silence Packing exhibit covered the Grove with backpacks on Tuesday to memorialize the approximately 1,100 college students across the nation who die by suicide every year, according to the American College Health Association. 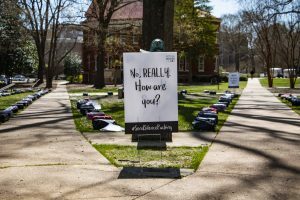 The University of Mississippi chapter of Active Minds, a non-profit organization that raises awareness about mental health, teamed up with the National Active Minds Organization based in Washington, D.C. to create the visual display. 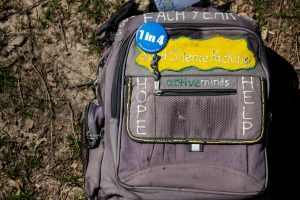 The display, which aimed to raise awareness about mental health and suicide on college campuses, includes backpacks and tables lined with pamphlets. The University of Mississippi chapter of Active Minds scattered backpacks across The Grove yesterday to raise awareness about suicide and mental health. Photo by Christian Johnson. The University of Mississippi’s Active Minds chapter first brought the exhibit to campus in 2018, making this the group’s second year to host the Send Silence Packing event. The traveling exhibit is hosted on 30-40 campuses each year, depending on the requests sent in by universities. “The program is designed to raise awareness about the incidence and impact of suicide, connect students to needed mental health resources, and inspire action for suicide prevention,” Sistrunk said. Sistrunk believes that the campus and community have become more open to the conversation about mental health since the 2018 exhibit. She said that when she when she was a freshman, the conversation was subdued, and she thinks events like this have increased student awareness and encouraged people to speak up about mental health. “Send Silence Packing catalyzes conversations in a way that contributes to a community’s overall positive climate for mental health and encourages people to seek out helpful resources for themselves, friends or loved ones,” Sistrunk said. Right Track Medical Group and Communicare, two counseling centers in the Oxford area, came to support the event and set up tables beside the exhibit to offer advice and resources. Representatives from the University Counseling Center and the American Foundation for Suicide Prevention were also present. The event was co-sponsored by Right Track, which emphasizes outpatient behavioral health treatment by providing therapy and medication management services, in addition to several on-campus organizations, including the Associated Student Body, Alpha Tau Omega, Chi Omega and Kappa Kappa Gamma. “With the increasing rates of depression and anxiety in the 18- to 22-year-old age group, awareness and knowledge of resources is so important,” Right Track outreach director Carol Ann Hughes said. According to the National Alliance on Mental Illness, 1 in 4 people between the ages of 18 and 24 has a diagnosable mental illness, and more than 25 percent of American college students have been diagnosed or treated by a professional for a mental health condition within the past year. Sistrunk said she wants Send Silence Packing and other events hosted by Active Minds to continue opening the discussion about mental health in a way that helps students without stigmatizing the problems they face. The UM Counseling Center is located on the third floor of Lester Hall and accepts walk-in appointments from noon to 4:15 p.m. Monday through Friday. Students can call (662) 915-3784 to schedule an appointment. The National Suicide Prevention Lifeline, 1-800-273-8255, offers a confidential service to help people in suicidal crisis or emotional distress.